How to successfully detect tagging on Canadian stamps? Some of the most frequent questions we receive have to do with tagged stamps. What is tagging? How can I detect tagging? What is the difference between phosphorescent and fluorescent tagged stamps? Winnipeg vs General tags? Many collectors have these stamps but are unable to differentiate them from the regular issues and that can be very frustrating. What are phosphorescent and fluorescent tagged stamps and why were they developed ? How can we tell them apart ? First of all, we are referring to stamps with fluorescent or phosphorescent tagging, not stamps printed on fluorescent paper. Fluorescent paper actually has miniscule, fluorescent fibers embedded in the paper the stamp was printed on. When exposed to a UV light the whole paper of these stamps glows. 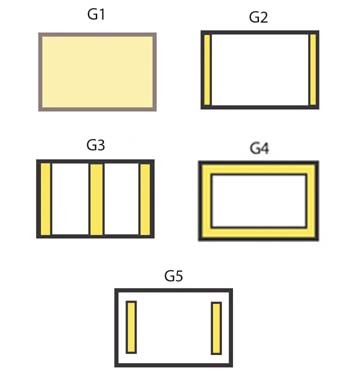 The degree of glow varies with different stamp issues, which is why catalogues, such as the Unitrade Catalogue of Canadian Stamps, use abbreviations to characterize the variances, for example : HF(high fluorescence,) DF(dull), LF(low) and HB(hibrite). So, what are tagged stamps ? These are stamps which have luminescent bars overprinted on them which glow when exposed to a UV light. These bars, or tagging, were either applied in a phosphorescent or fluorescent coating. Why were these stamps developed ? Simply put, to save time ! In the early 1960’s, it became evident that the volume of mail going through post offices was increasing. Cancelling stamps by hand was obsolete, but even with sorting machines, a postal employee still had to feed the envelope into the machine in the proper direction to make sure that the machine cancelled the stamp in the right place; still very labour intensive. However, new technology had the answer. Automated cancelling machines were invented, but these machines needed some kind of a guide to know where to place the cancellation. So, in 1962, luminescent tagging was introduced on Canada stamps. The tags acted as guides, allowing the cancelling machine to locate the corner of the envelope where the stamp was, rotate the envelope if needed, and place the cancellation in the right spot. How can we tell the different types of tagging apart? Well, there are two kinds, phosphorescent and fluorescent. Both coatings are luminescent and react to a UV light, but in different ways. Phosphorescent tagging was introduced in 1962 and was called Winnipeg tagging, since the city of Winnipeg was the first to test the new machinery. This tagging can be a little tricky to detect. For instance, when you shine a UV lamp on a Winnipeg-tagged stamp, you probably won’t see much. But, when you remove the lamp, an after-glow appears after a couple of seconds. Sometimes it is easier to just hold the stamp up and move it at different angles in normal light. The striping of the tagged bars can sometimes be detected with the naked eye as a subtle shading difference in the paper. The bars appearing slightly shinier or darker, depending on the observer. Phosphorescent Winnipeg-tagging was the norm for 10 years. Then, in 1972, General (or Ottawa) tagging was introduced. General tagging is a fluorescent coating and was found to be a more suitable medium for tagging stamps. 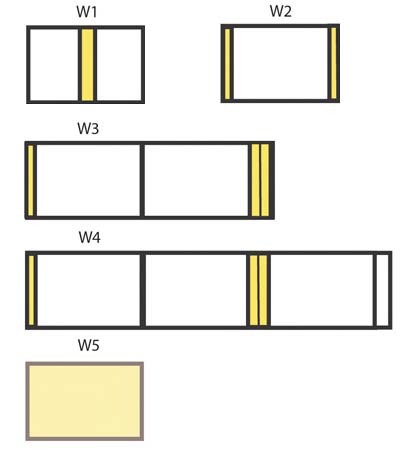 The first coating to be used was called an OP4 compound, but it was discontinued when postal authorities discovered that it sometimes leaked, either onto different areas of the stamp or onto other non-tagged stamps. The second, and final compound, was called OP2. This General OP2 tagging solution was stable and has been in use since 1973. So how can we tell if a stamp has fluorescent General tagging? Happily, because the tagging shows up to the naked eye as a slightly glossier bar on the stamps, or when exposed to a UV light, it glows brightly, usually in yellowish-green. 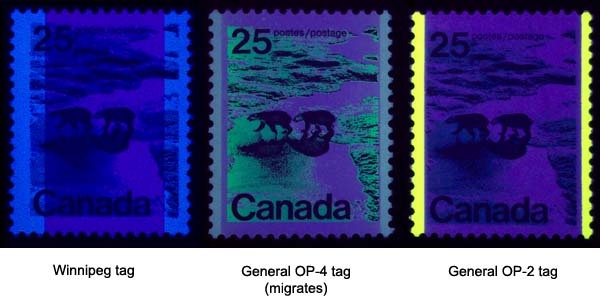 For viewing Canadian stamps that have tagging, a long-wave UV lamp is the best. A note of caution: it probably isn’t a good idea to stare into a UV light source for a long period of time. Some sources think it could damage the eyes. However, the long-wave ‘black light’ lamp sold by Arpin Philately is ideal since it has a lower energy light source that does not cause sunburn or skin damage. So, we hope this helps you out. 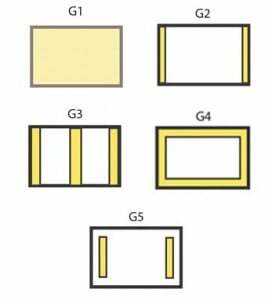 Listed below are all the different tagging styles that have ever been printed by Canada Post. Happy hunting through your stamp collections! How to recognise a dull fluorescent stamp? With a UV lamp and ideally with an other stamp to compare. Not all stamps were apparently issued with tagging. Why are some not tagged? My 1985 booklet pane, for example, only has full tagging on the 34c, one side on the adjacent stamp, and no tagging at all on the other four. Actually The Unity album requires both tagging types. Canada candle #606p is a tagged WCB “Winnipeg Center Bar” and is required on page 95 of the Unity album. Canada candle #606pi is a tagged GT2 “General Tag 2 bars” and is required on page 94 of the Unity album.